Now you can buy the new 2 Seater BIG Class Lexus truck ride on for kids with the ultimate benefit of the wireless Magic Cars steering wheel. It's like having 2 cars in 1! Trend Times Toys kicked it up a notch as this is an interference free wireless remote control (RC) Lexus ride on car with working stereo, real rubber tires, real 4 x 4 wheel drive system(1 12 volt motor for each wheel! ), usb input, memory card slot, and real leather seats! What does that mean? You can now watch Bubble Guppies in your new Lexus or whatever other file or media you like. Plus, we give you the Magic Cars® wireless remote control so you can drive the car around with or without your children inside the car. Flick the switch, and you can give full "ride in control" back to the child inside the car. Buy today and you will receive the Playtime Power Pack 24 volt battery upgrade made of 2 combined 12 volt battery packs which will give you continuous run times of 2-3 hours! Reach speeds of about 6 mph and holds up to 130 pounds. Great for ages 1-8 or 1 larger child and you can select from 3 separate speed settings for beginner, intermediate, and advanced drivers. Plus, you can tell your child, "Hey, be nice, I bought you the Lexus truck for your first car". Be the envy of the neighborhood in this 12v motor twin rechargeable battery pack powered machine. Drive forward, backwards, left, and right via the steering wheel. Watch the official Trend Times Magic Cars® remote control ride on RC car commercial below and enjoy what is so amazing today. The people who really know will drive a Lexus SUV truck priced at over 80,000 dollars. Choose from black, red, white, silver, or blue colors. 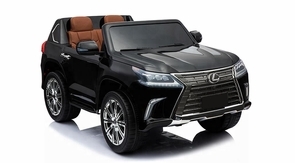 The driving experience is admired by other auto makers, and the same is true about the electric Lexus truck ride on car SUV for kids with opening doors and real leather seats. Feel good! Only Magic Cars® arrive free with the best in class 1 year bumper to bumper ride on car factory warranty ($149 value). Measures over 4 1/2 feet long, 2 1/2 feet wide, has an adjustable seat belt, and comes with MP3 hookup too. Real working stereo and sound effects add to the overall fun factor of the Lexus SUV ride on car. Yes, we carry all spare parts just in case and this Lexus ride on truck comes with the best in class Magic Cars® 1 year bumper to bumper factory warranty. Choose from white, black, and red colors. Length: 52", Width: 30", Height:20"
Weight Capacity of 130 Lbs. What an awesome product! I bought it for my 16-month old grandson and he loves his Lexus SUV more than anything. The three different modes of speed settings is a great feature. My older grandson, who is 6-year old, drives it in advanced mode, while we make sure the car is always in beginner mode when it comes to little one. The remote is very handy. Overall, I am VERY happy with the purchase. First of all, thanks for such a quick shipment and delivery. Runs at pretty good speeds and no wobbling. Definitely was the big hit at our party. Stop searching. You have found the BIGGEST CLASS 2 seater battery powered ride on Jeep style trucks make for amazing fun inside or outside of the house and is a true 4 x 4 with 4 motors for plenty of power on grass, dirt, pavement, and even light snow! Magic Cars brings you the all new 2 Seater BMW SUV ride in car with real opening doors and functioning stereo!